Since this picture was taken in September 2010, you have successfully undertaken no fewer than 38 courses of study, as well as numerous projects, reflections, surveys, and various exercises intended to prepare you to be effective physicians. In doing so, you have engaged and answered (usually correctly) several thousand individual questions of various types. Identify these five famous historical figures, and describe what they have in common? Warning: The second part has an easy answer, but bonus points for the less obvious. Albert Einstein was, arguably, the most famous scientist of the twentieth century, revolutionizing the way we consider nuclear power, time and space. In his later career, he became very much involved in social causes, largely related to promoting peaceful applications of this emerging technology. Mahatma Ghandi led the Indian nation to independence. In doing so, he became a symbol of non-violent protest. Mother Teresa originated and led a charitable movement in Calcutta that has not only given rise to numerous similar efforts, but also drawn attention to the plight of the poor worldwide and provided an example of what can be accomplished through non-political personal effort. Martin Luther King led the American civil rights movement in the fifties and sixties. Through his brilliant oratory and philosophy of non-violent protest he became the rallying point for millions. He was considered to be more influential than any elected official, including the President. Norman Bethune was a Canadian physician who devoted his career to a series of roles, all serving underserviced populations in need. He has become an internationally famous example and embodiment of the socially active physician. His recently released biography (Pheonix: The Life of Norman Bethune, by Roderick Stewart and Sharon Stewart) is a great read. The obvious similarity is that they all led positive social change. Different contexts and different styles to be sure, but all tremendously effective leaders. The less obvious answer is that they led without any political or organizational mandate to do so. They had no direct authority over others (although Ghandi was eventually elected to public office, I would argue it was after he had achieved social activism). Their leadership emanated from their ability to express their vision, and their willingness to become personally involved in the solutions. The qualities they exhibited were compassion (to the needs of their fellow citizens), courage (to express dissenting or unpopular views), and commitment (to give of themselves and become personally involved in the solutions). Their leadership was not in the pursuit of personal advancement or glory, and their influence arose from the recognition of that truth by their fellow citizens. To use a well-worn vernacular, they not only talked the talk, they also walked the walk, and that quality is always intuitively obvious to everyone. 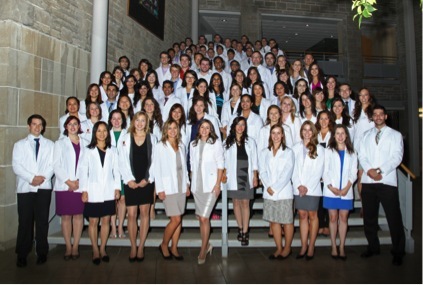 So, what has all this to do with you, the graduates of Meds 2014, shown below at your White Coat Ceremony only 2 years ago, and now ready to be released upon an unsuspecting world? This is all obviously my fairly heavy-handed challenge as you leave the nest and take up the next stage of your professional careers. A physician’s work, as I’m sure you’ve come to learn, is in large part about the very qualities of compassion, courage and commitment exhibited by the famous historical figures I described. You have those qualities. Beyond your individual practices, each of you will encounter opportunities to have a positive influence within the communities and organizations in which you find yourselves. I hope you’ll be open to those opportunities, enticed by the potential to bring about positive change within your world, and willing to devote the effort required realizing those results. Real leadership is tough.